This quiche recipe is another great way to eat veggies as kids love the unique taste when u add cream/whole milk to it along with eggs. I used Egglands best eggs for this recipe. This is a high protein diet for your morning breakfast to boost your metabolism. 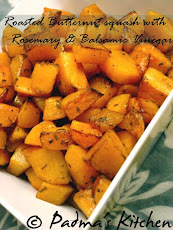 Perfect for breakfast, brunch as well as for lunch too! 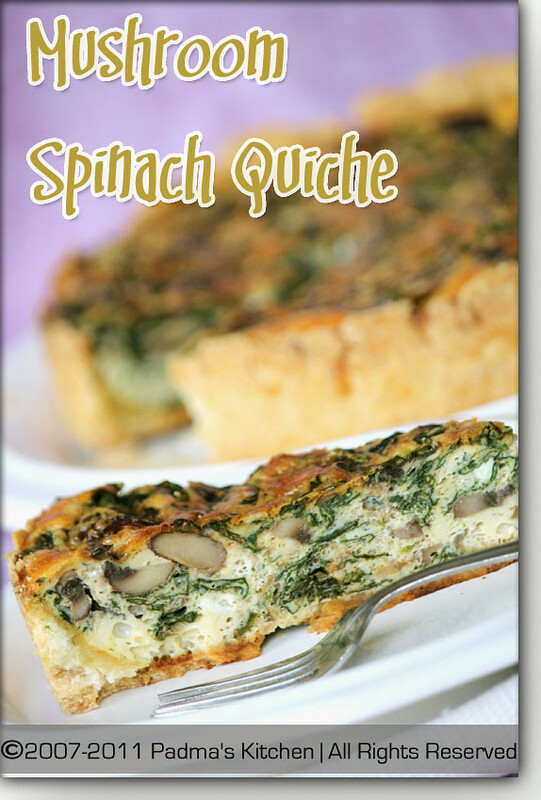 If you want to read more about quiche and how the recipe evolved over the years, This post "Formula One" by Momadeon [Coleen] has given very detailed info. I loved the way she writes and kept on reading her blog for a long time until I realize I have to publish this post!! Preheat the oven to 375°F[190°C]. Heat 1 tablespoon of olive oil in a saute pan. Add crushed garlic or garlic powder and the sliced baby bella mushrooms, you can use white button mushrooms too. Saute till the mushrooms gives out all the moisture. Then add paprika powder and cumin powder to it. Saute for another minute and remove from heat. Combine the eggs, milk/cream, salt, and pepper in a food processor or blender. 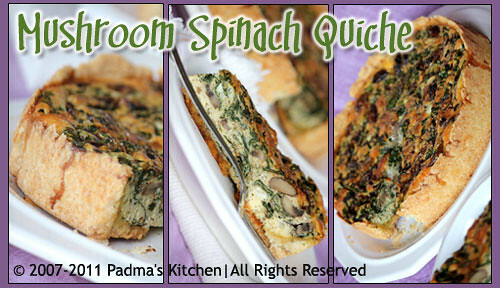 Layer the spinach, sauted mushroom, and cheese in the bottom of the pie crust, then pour the egg mixture on top. Bake for 35 to 45 minutes until the egg mixture is set. Cut into 8 wedges. Leftovers can be stored in freezer for up to 3 months. Refrigerate the leftover and heat in a microwave for 30 secs when you wanna eat it. Instead of 6 eggs, try 3 whole eggs and 5 egg whites. For additional flavor sprinkle some freshly grated nutmeg to get that unique taste. 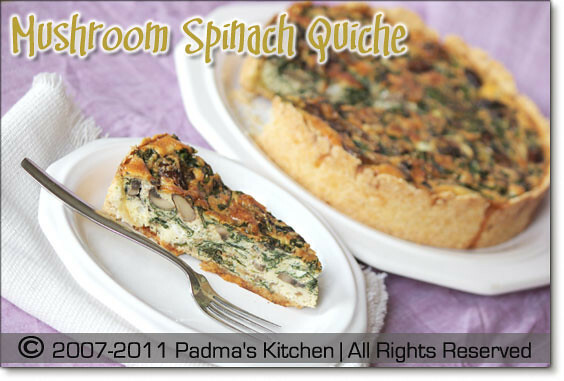 Feel like having a slice rite now,thats an interesting,healthy and filling quiche..